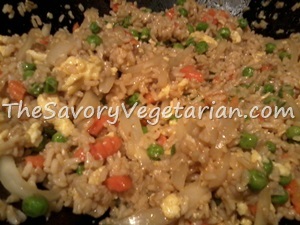 This vegetable fried rice recipe is quick and super easy to prepare. To try and keep it reasonably healthy we used whole wheat rice instead of white and we limited our vegetable selections to a few of our favorites. You get your healthy carb, your protein and your vegetable all in one, deliciously easy bowl! Note: Mix and match vegetables to taste. We kept it traditional but you can use whatever you want. It still tastes fantastic. Prepare the rice following the instructions on the package. We generally use the rice cooker, but for the purposes of keeping this truly a quick, easy recipe, we made ours on the stove. When it is done, remove it from the heat and set it aside to allow it to cool slightly, and the excess moisture to dry out... about 20 minutes. Heat a large wok or skillet on medium heat. If your skillet sticks easily, add a small bit of oil or cooking spray to the surface of it first. Then add your eggs and scramble. When the eggs are set, remove them from the skillet and set aside. Add a little sesame oil to the skillet and toss in the onions. Saute the onions until they start to turn slightly clear. Mix in the peas and carrots. Stir fry until the veggies are heated through and to your liking. Add in the rice and eggs and mix well. Add in a slight bit of soy sauce (to taste) and agave, or use just enough of your favorite Asian stir fry sauce to coat the mixture. Cook until heated through, stirring frequently. If you can't find sesame oil, vegetable oil works fine. It just has a more authentic taste if it's fried in sesame oil. 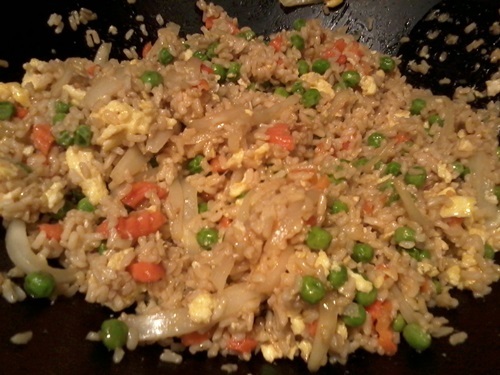 Preparing your rice ahead of time and setting it aside to dry out will help keep this vegetable stir fry recipe from becoming a mushy mess when you start blending it together.